Steve Hodge is a former England football midfielder. He played football with top quality teams for a remarkable seventeen years. Teams Steve played for included: Nottingham Forest, Leeds United, Tottenham Hotspur, Aston Villa, QPR and of course – England. Steve was capped 24 times by England and played in two world Cups, Mexico 1986 and Italy 1990. He played under legendary managers such as Brian Clough, Howard Wilkinson, Sir Bobby Robson and Terry Venables. 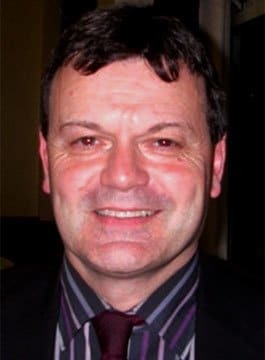 Steve Hodge played in the tragic semi-final at Hillsborough in 1989 and also the 1986 FIFA World Cup quarter-final against Argentina. Whilst Maradona achieved World Cup victory with his ‘Hand of God’ goal, at least Steve gained some compensation from the match, as he has Maradona’s shirt from that legendary game! Steve has continued to be involved in the game as a qualified A licence coach at the Nottingham Forest Academy and as an FA ambassador as part of England’s World Cup bid. As a football after-dinner speaker, Steve Hodge delivers recollections of his career, recalling his great moments including fresh stories about Gazza, Clough, Cantona and of course, how did he obtain Maradona’s ‘Hand of God’ shirt?